The epidemic of lack of Khushu’ is evident. Hardly anyone is clear of it yet most of us are doing very little to set things straight. Life is passing by and one is getting closer to death but all what most of us seem to do is think that someday things will get better; something will happen and I will find khushu’ in my Prayer. Contrary to what most people thing, allowing our natural state of Khushu’ is a process. It is cultivated by doing certain things well, Prayer after Prayer, day after day, until one has developed the skill of commanding one’s heart to focus and feel one’s standing before Allah. In this course you will, insha’Allah, learn how you can start your journey towards khushu’ and develop the skill to stay focused in the Prayer. The taste of real life is found by those fond of the Prayer, those who experience the most outstanding moments in life while standing before their Creator, reciting His words, while their souls take a journey in Paradise. This is what life is all about! Those who love the Prayer. People who have neglected the Prayer: Those are the truly deprived. People in their graves: Those wish they can come back for a few moments and spend those moments in Salah. The best moments in life…real life. How happy you are to pray when the time of prayer comes (Average)? Rate yourself on a scale from 1 to 10. Those who thrive and flourish with the fruits of Prayer. Those who pray only with their bodies, not their hearts. Those who don’t pray altogether…the truly deprived life. The Prayer is light in the heart, strength in the body, elevation of the soul, ethical advancement, freedom from the shackles, and the apex of meaningful living. Thabit Al-Bunani and his special Du’aa, what was that? The Prophet PBUH said: ((The best of your acts is the Prayer)) [Ahmad & Ibn Majah: saheeh). Al-Mirwazi said: The Prayer was the first and foremost act of worship that Allah prescribed to His servants. The Prayer is the physical manifestation of the meanings of Tawheed. It is the full-range expression of tawheed where the heart and the body make a clear statement about tawheed. What does Allah say at the beginning of Surat al-Mu’minoon (the Believers) verses 1-9? Ibn al-Qayyim commented: be careful that you meet Allah with little or no share of Islam or enthusiasm to it. Those who believe in Allah and love Him are more drawn to the Prayer, they find sweetness and rest in it; thus they tend to elongate it and focus on it. Ibn al-Qayyim: Salah is the accurate gauge of how much faith one has. One’s use of time clearly shows the direction of his/her heart. Those who love find their heart present when they’re with the one they love. The time and quality of this time you spend praying shows how much love you have for Allah. Calculate the time you spend praying every day (in minutes). Then add up the days to work out the time for a week (including weekends). Calculate the percentage of this to 168. 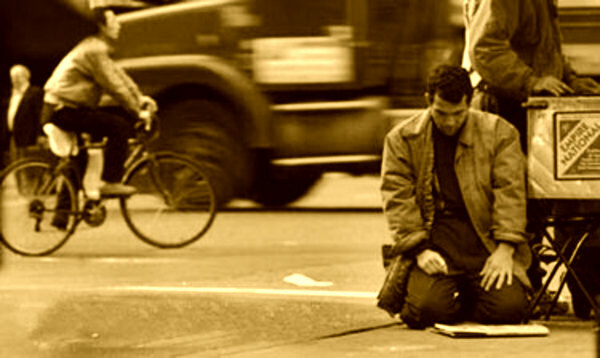 The Prophet (PBUH) said: “The first thing one will be held accountable for is the Prayer. If it turns out to be sound, then the rest of his action will be sound; if it turns out to be unsound, the rest of his action will be unsound)). The Prayer perfect in its form; it engages the whole being of a person. True believers find sweetness in the Prayer; this is the closest humans can get in this life to the taste of Paradise. For some the Prayer is Paradise; for others it is misery! How? They Prayer is a sign of Allah’s mercy and wisdom. Hasan al-Basri was asked about the reason behind the beauty those who pray at night possess. He said: “They stood privately in the presence of the Most Merciful so He bestowed light upon them.”. ((Indeed, the Prayer prevents from tendencies and acts of lewdness and evil)) [surat al-Ankabut: verse 45]. ((Indeed man is created vulnerable; if evil touches him, he is helpless; if good comes to him he is miserly, except those who observe the Prayer)) [Surat al-Ma’aarij: verses: 19-22]. The Prayer can only yield this effect if prayer properly inwardly and outwardly. Allah often directs the believers to seek help in the Prayer. The Prophet (PBUH) would resort to praying in hard times. Because the Prayer is the most perfect act of worship in its form, it is also the most perfect in the impact it has on the person. Each act of worship is meant to have a positive impact on one aspect of the human. The Prayer has encompassed the secrets of all the acts of worship. The Prayer heals the heart and the limbs, the mind and the emotions, the internal and external of a person. This is why Allah invites the believers to resort to the Prayer in all their affairs. The Prayer instills in the heart the bigger truths of existence. The Prayer shapes one’s outlook on life, his/her understanding of oneself, and his/her relationship to Allah. The Prayer is the book of life and the dictionary that offers the right definitions. This is why Allah prescribed 5 obligatory Prayers a day, so we keep life in perspective. Allah made cleansing of the limbs a condition and preparation before engaging in the Prayer. There are great lessons in the strong connection between external and internal acts of purification. We will visit this meaning again later in the course. Ibn al-Qayyim describes the Prayer as a feast that offers all types of food, fruits, sweets and drinks. Each of these is meant to have a positive impact on the person. Thus he/she has gained so much dignity, purity, strength, and enlightenment as soon as they perform the Prayer. All this engages the heart and yields an unparalleled level of sweetness and happiness. 4 Responses on The Prayer blows the Soul back into your Life"
May I know if this course is being offered online and if registration is still open? The course will be made available soon inshaAllah, hopefully around January. It will be announced on this blog inshaAllah. You can subscribe for updates, jzk. Please could you kindly share the link for the course.